The website of the current Chandler’s Ford Methodist church says that from 1852 – 1857 a small group of Methodist people met in a cottage at Fryern Hill. In 1900, the first Primitive Methodist Chapel was opened in Brownhill Road. The minister was the Rev. 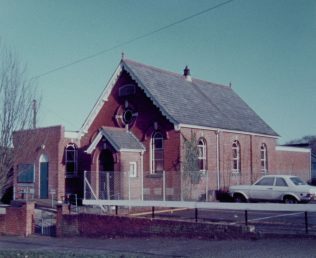 Stewart Hooson and the chapel was part of the Eastleigh Primitive Methodist Circuit. A new chapel was built in 1969. At the time of Keith Guyler’s photograph in 1985 and on Google Street View in 2012, the Brownhill Road building was used by Age Concern.